When we see injuries in children’s hands and wrists, broken bones (fractures) are most common. Children’s bones are not simply smaller than adult bones; they have a different consistency and quality. They are much softer, unlike the drier and more brittle bones of adults. Because of this difference, injuries are evaluated differently and treatment can often differ as well. Children, being curious and inexperienced, are particularly susceptible to broken bones. Fingertips might be slammed in a door, caught in machinery, or otherwise injured in falls, during play or while playing sports. Whenever a child is injured, they should be examined by an adult. If a finger, wrist or forearm is unaligned in any way, you should visit the emergency room right away. If the finger, wrist or forearm is normally aligned, and can be easily moved, apply ice and continue to check on the condition of the affected body part. Please note that not every fracture appears unaligned or negatively affects mobility. If the body part is significantly bruised or swollen, an x-ray is the only way to determine whether a bone is broken or not. The physician must observe the injury and conduct a physical exam. In addition, you should be prepared to provide the medical history of the child as well as information on how the injury occurred. A cast or splint is the most common treatment for children with broken fingers, wrists or hands. 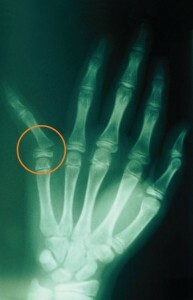 A bone may have to be “set” manually if the broken bone is not aligned. 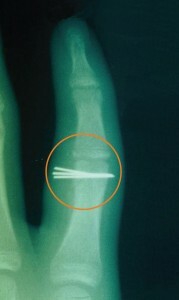 A metal plate, screws, pins or rods may be employed to reset a severe fracture. Due to the consistency of children’s bones, healing may happen in as little as a month. However, when a fracture disrupts the joint surface, it usually requires surgery to be realigned properly.